Son of James Sant, July 1866. Son of James Sant, July 1866. 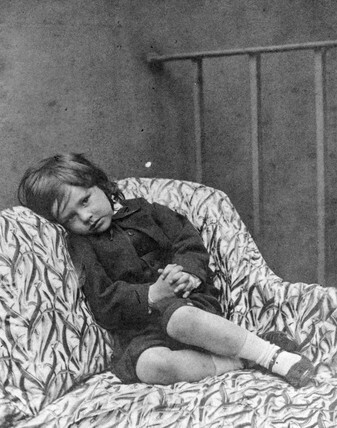 Photograph by Lewis Carroll. Carroll admired Sant's paintings of children and spent several days photographing at his house. Charles Lutwidge Dodgson, better known by his pseudonym Lewis Carroll, was the author of the clasic childrens book, 'Alice's Adventures in Wonderland' (1865). Carroll was one of a very small number of mainly British amateur photographers who excelled during the early years of photography. He began taking photographs in 1856 and was soon producing far les stilted and artificial portraits, especially of children, than those taken by the vast numbers of profesional portraitists of the time. Albumen print. Charles Lutwidge Dodgson (Lewis Carroll), self-portrait, c 1880s. Xie Kitchin with violin, 1875-1880. Xie Kitchin as Penelope Boothby, 1876. The Misses Lutwidge playing chess, c 1858. Reginald Southey with skeletons and skulls, 1858-1859. Lewis Carroll, English writer, self-portrait, c 1860s.